with Nick Jones and Diana Cruz from Natural Tango in Denver, Colorado. All events take place at the Community Centre, right in the heart of beautiful Byron Bay, known for its alternative and beach lifestyle. World Tango Champions Daniel Nacucchio and Cristina Sosa will return to Australia this year for a new Melbourne Festival. Together with tango legends Fabian Solas and Lola Diaz they will spearhead a weekend of celebration of the Argentine culture. Melbourne teacher and former Australian stage tango champion Fabio Robles will produce a new tango show “One Night in Buenos Aires” which will include the visiting maestros together with leading Melbourne dancers and a quartet of Melbourne musicians with Leo Intilangelo on bandoneon. Melbourne is a city that has preserved many of her historic buildings some of which have dance floors that were the scene of many of the great balls and social occasions of 19th and 20th century. Four of these beautiful buildings will provide the backdrop for the festival: Parliament House, The Collingwood Town Hall, The Fitzroy Town Hall and The State Library. 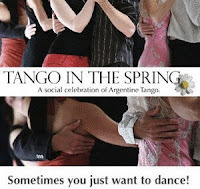 21 workshops with the visiting maestros, 2 milongas, the Tango Show “One Night in Buenos Aires” and an Argentinian day with music, dance, food and exhibitions make up the Festival. Organised by the Tango Social Club of Canberra this is a bi-annual event held to coincide with Canberra's Floriade (a festival of spring with magnificent floral displays) and the long weekend. Four days of dancing to music by DJs from around the country and social events, this is an encuentro - a chance to meet and dance with tangueras and tangueros from around the country.